Nine year old Ida Joner lives with her mother in a small neighbourhood some way from the nearest town. Early one evening she gets on her new yellow bike and heads to the local shop to buy some sweets. A short while later and she has not returned and her mother, Helga, has grown anxious. When she calls the shop the owner says Ida never arrived. Helga calls her daughter’s friends, then her sister, Ruth. With her panic rising the sisters search the local area to no avail and then call the police. Inspector Konrad Sejer tries to reassure the mother and sets about organising a search. Two days later and Ida’s disappearance is front page news, her mother is distraught, and Sejer’s investigation appears to be going nowhere. He has few clues, but is methodological and patient. Time, however, is not on his side; Sejer knows that the longer Ida is missing, the less likely it is she’ll be found alive. 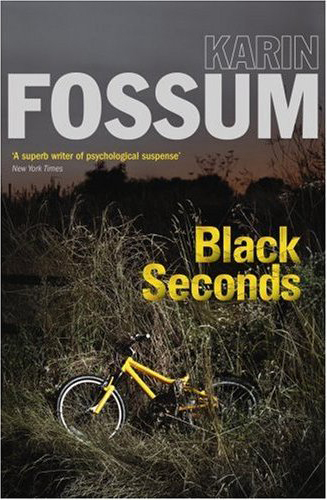 Black Seconds is the sixth book in the Inspector Sejer series and the first I’ve read. I found it somewhat of a curious read as there was not much mystery to the case, yet it was oddly compelling. I think there are a couple of reasons for this. First, the storytelling is quite understated, simply focused on the unfolding of the events and its consequences to those involved. The characterisation and social interactions are keenly observed, providing a high degree of social realism and emotional sensitivity. The hook is the exploration of how crime and life are rarely black and white; through mishap and misadventure people can find themselves on the wrong side of the law and bound up in situations that are difficult to resolve. Second, the telling had a nice cadence and descriptive prose. The combination produced an engaging style that kept the pages turning, despite there being few moments of high drama and the plot being relatively transparent. Overall, a story where style and telling elevated a somewhat average story to into a captivating read. I had my first encounter with Fossum last week, reading 'Calling Out to You' (a.k.a. The Indian Bride) and I felt much the same way. The mystery element of it is almost secondary, it is much more about the motives, the consequences, the aftermath. Very different from other Scandic crime fiction I have read recently, but reminiscent perhaps of the Martin Beck series. Yes, agree - has a Martin Beck style.